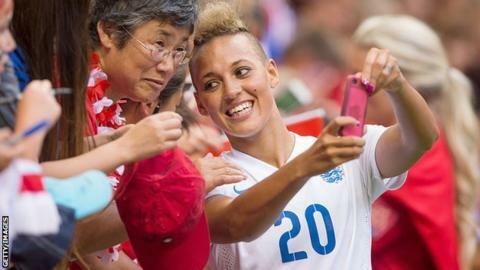 England forward Lianne Sanderson says she does not expect to be selected for her country again after speaking out in defence of team-mate Eniola Aluko. Striker Aluko has accused women's head coach Mark Sampson of "bullying and discrimination". Sampson has been cleared of wrongdoing by two investigations and vehemently denies the claims. Sanderson, 29, told BBC Radio 5 live her support for Aluko could mean her international career now suffers. The forward - between clubs following a serious ligament injury - has been capped 50 times by England. Last week, she told BBC Sport the England camp's culture was one where "everyone must conform". On Tuesday, Sanderson - who was most recently at Western New York Flash - told BBC Radio 5 live's Phil Williams show: "When I come back from my injury, which will be soon, I'll be able to be selected for England again. "Will I be selected? Probably not, because they know I'm a key witness in this thing. You're trying to do the right thing but that shouldn't mean that your England career suffers because of that. "If they changed the coach, it wouldn't change the culture. I do think it's a thing the FA need to make better. "I don't think it's just Mark. But these allegations that have been made are very serious and I think they have tried to downplay them. "It's something that's been going on for a long time. People ask 'why now?' but it's nothing to do with the Euros, we've been wanting to talk about this for a long time." When contacted by BBC Sport, the FA said it had nothing further to add. Meanwhile, shadow sports minister Dr Rosena Allin-Khan has echoed calls by anti-racism campaign group Kick It Out and the Professional Footballers' Association for a new FA inquiry into Aluko's claims. "The claims made by Eniola Aluko are deeply worrying. This is why I believe a new investigation is necessary," she said. "At a time when the FA need to be doing all they can to attract young women and people from minority backgrounds into football, they need to be open and transparent. Young girls look up to players like Eniola as role models; their aspirations will quickly diminish if they lose trust in the people at the top of the sport."